Lifetime Series #1: Reset, Replenish, Repeat. 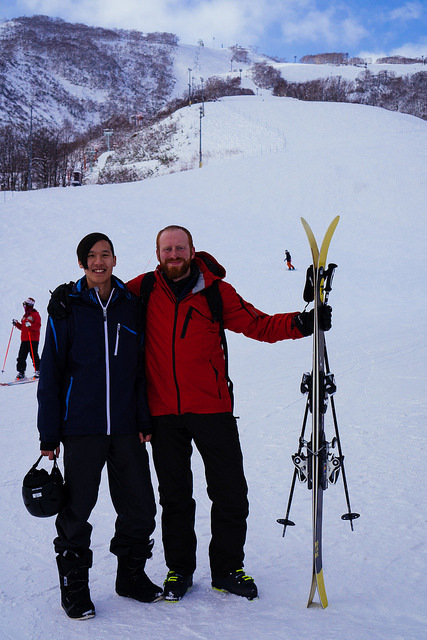 Phong and Davis, skiing in Niseko at the Niseko Mountain Resort Grand Hirafu. I wake up most mornings with the same thought of “pausing life” and what they would feel like. I guess the millennial in me craves to travel in order to run away from my problems of school, life, work, and family duties, more so, hanging onto the motivation to keep grinding every day. But I can guarantee my thought patterns aren’t too far off from my fellow millennials. I guess one can call it the “Eat, Pray, Love” syndrome (EPL syndrome for short), similar to the 2010 motion film starring Julia Roberts. During these restless nights, I search for ways to rediscover my passion or tap into the bank of motivation to truly understand my potential. And one of my ways of replenishing inspiration is by connecting and sharing stories with those in my social circle. Being involved in UNAVSA the past five years, the concept of “social circle” expanded exponentially for me. I have been truly blessed to surround myself with the most intelligent, creative, and inspirational individuals. They became a circle of support in difficult times and in successful time and as of late, they became a circle of inspiration through sharing their stories that spawned from common struggles. Olyvia: A common trend among millennials the past half decade is a brief pause in life or what you could call the “eat, pray, love” syndrome, where millennials quit their jobs and travel the world. I know were talked about this in the past and I wanted to know more about how you came to that decision to do so. Phong: I was really unhappy at where I was in that point of life with my career as an engineer and most of my unhappiness stemmed from work. . .it was so unfulfilling. But I was torn because I’m an engineer and I made a good salary to live off of. Ultimately, I needed to escape all the noise from home, escape the constant pressure I felt from all angles. I had questions I had to answer, but I couldn’t answer those questions with all that noise. So…I went to Japan for a month with my best friend, Davis. Olyvia: So why Japan, though? Phong: It’s always been a place I wanted to visit since I was young. I watched Japanese cartoons growing up and it was an insight to how their culture is so different, their discipline and passion to name a couple. I saw pictures and videos of the Fushimi-Inari gates – it is a spiritual place with special energy. I would talk to people and say “I would love to go” and after years and years of not doing anything that supported this idea, I finally had the courage to go and it seemed like the best place for me to get away. 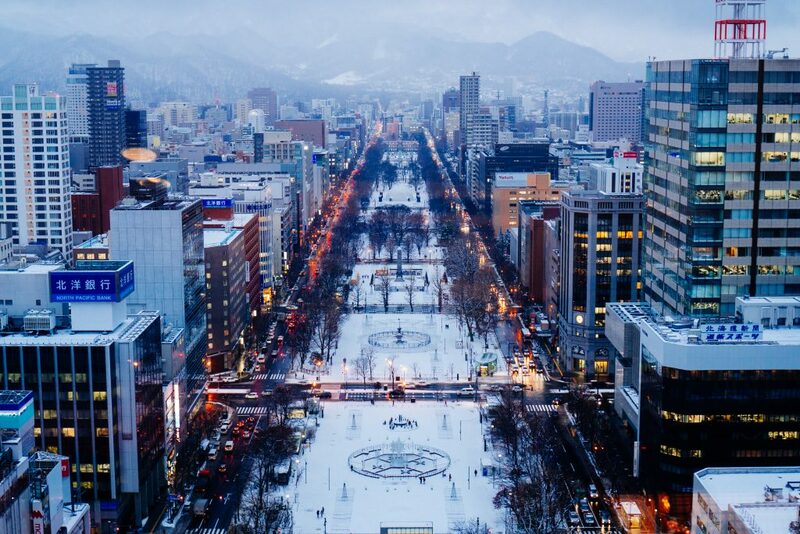 View of Odori Park in Sapporo, Japan. Olyvia: What was your travel route? Why did you decide to travel in a particular way? Phong: We flew into Tokyo, but only as a stopping point. The first destination was Sapporo. We wanted to hit the ski season there at the right time and Japan has the best type of snow. Afterwards, we flew Southwest to Hiroshima. In Hiroshima, we wanted to see what it looked like since it was such a large part of U.S. history. From Hiroshima we traveled west to Himeji, Osaka, Kyoto, and Nara (there are deer that have learned how to bow when given food!). We took the JR Train to Tokyo where we ended our trip and spent New Years with a friend from home who stayed with us in Tokyo. Olyvia: Memorable person you met on your trip? Phong with a group of Japanese business people eating Shabu Shabu in Hiroshima, Japan. Phong: The funniest person we met was in the hostel that we stayed in Hokkaido (Northern Island). We were expecting to be greeted by Japanese people but instead were greeted by being these Australian dudes, Stew & Dirk. Stew was working at the hostel and traveling for fun. He was very goofy and happened to be the bartender. Dirk was more interesting because the residents of that hostel were enamored with him, other Australians there wanted to hang out with him and we were wondering ‘’why do these people want to hang out with him so much?”. He was actually Dirk Nannes, a Cricket player for the Australian team. It was rumored that he spoke full Japanese after I Googled him. Second, we saw Fred Armisen of Portlandia, in Tokyo. Davis and I ran into him and asked for a photo. He was super excited that we were English speakers. He was there because he was being interviewed by Japanese TV in Tokyo. I’m all in for a spontaneous adventure and I crave the passion to learn new things through meeting new people and even just roaming a new city by myself (of course, not wandering into dangerous places, duh) but that’s in regard to exploring new places where I know the majority of people speak English or at least Vietnamese. But that’s the essence of exploration and pushing yourself out of your comfort zone – that’s how true learning takes flight. And even if I think the world is too big for me to explore, the world sometimes is too small, such as in the case that Phong and Davis ran into Fred Armisen of the hit show, “Portlandia”. Being a Portland, Oregon native myself, it was great news to hear Fred is a total approachable and friendly. Diving deeper into the topic of relationship building, I think that was a piece of Phong’s trek that resonated with the whole idea of traveling and visiting different cities in the U.S. or across the globe. I’ve been fortunate to have the time and creative financial resources to travel to cities within the U.S. and visit old friends I met and bonded with through my UNAVSA years. I booked flights to bustling cities such as Boston and to more quaint and smaller cities, like Salt Lake City. 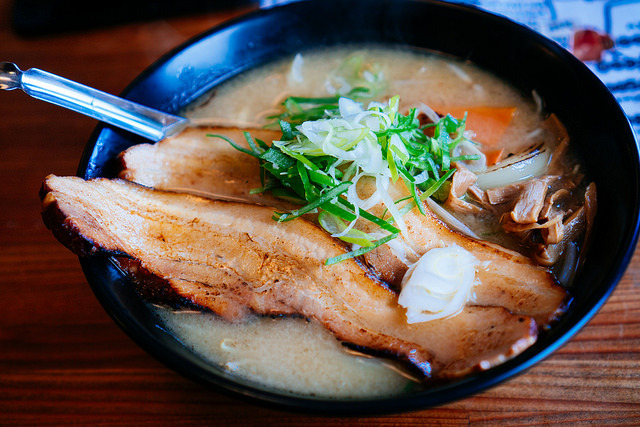 Housemade Ramen at the Kobito restaurant in Niseko, a mountain town in Hokkaido, Japan. Olyvia: What item did you buy in Japan that you were obsessing over? And what was one destination or landmark that you were stoked to cross off your bucket list? Phong: Maybe I was not obsessed with a particular item, but a type of food. I was obsessed with trying out omakase sushi. Just because it’s kind of a gamble letting the chef decide what to serve you, but that’s part of the allure. . . My number one destination/landmark was Fushimi Inari in Kyoto. It’s the place that has all of the orange torii gates, it was really peaceful and it felt very spiritual hiking up the path. It’s kind of a huge tourist trap though, when you get there are sooo many people crowding up the entrance trying to take photos. But it’s hilarious because the further in you hike, the more people drop off once they’re like, “ok got my picture – I’m out”. But we did the whole hike and it was really tranquil. I’m not sure why I wanted to go there the most, but all the imagery I’ve seen of the place throughout my life really drew me to it. Millennials are one of the biggest consumers of social media, it’s our form of self-expression. We put everything on there; photos of our families or significant others, the latte arts from our excessive coffee addiction, we document pieces of our lives. But it seems more so a competition among us millennials now, to locate landmarks, take the photo and post it on our social media handles and skip over the historical context. 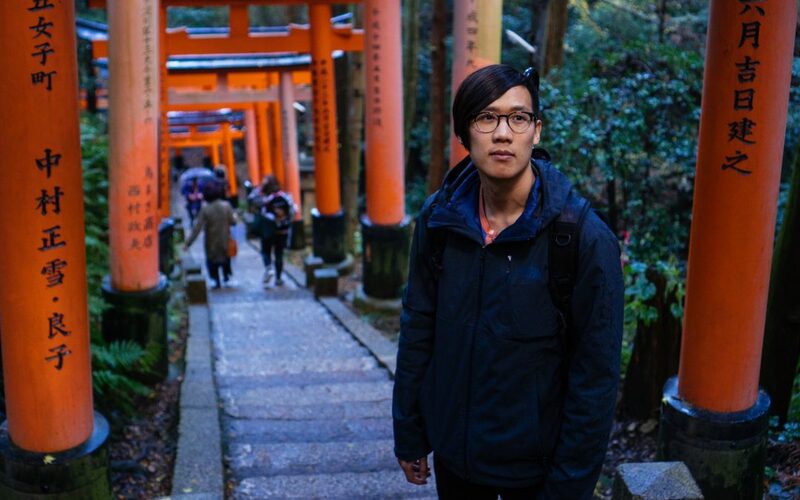 For Phong, he recalls his hike to the shrine that made his visit to Fushimi worth the three-hour train commute from Tokyo and how the hike left him with feelings of tranquility and fulfillment of crossing off this location from his bucket list and felt more meaningful accomplishing his goal. Olyvia: What did you learn from this who entire experience? How did you adjust back to life when you returned from Japan and what were some of the things you were really looking forward to changing from all the new knowledge you gained? Miyajima island located in Hiroshima Bay. 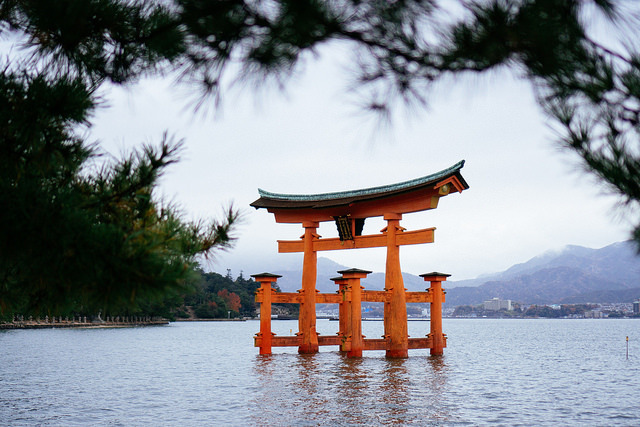 The torii gate marks the entrance to Itsukushima Shrine. Phong: Before I left for my trip, a friend gave me the following advice: trust the journey. Meaning not to worry about what I would gain from the trip and to just allow it to naturally happen by being in the present. I tend to be a worry wart and this trip has helped me to be more conscious of it. I feel like this advice is a universal truth, not specific to just traveling. Check out the following cities that Phong visited during his 14-day trek across Japan and the clips he crafted: Sapporo & Niseko, Hiroshima, Himeji & Osaka, Kyoto, and Nara & Tokyo.